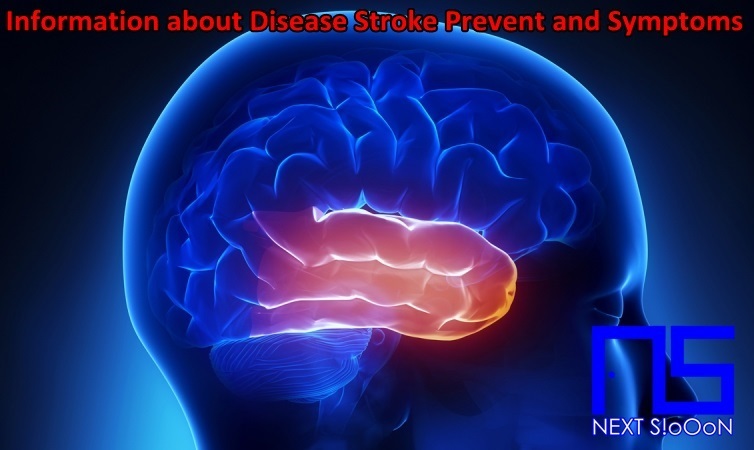 In this article Next Siooon will discuss about Disease Stroke, Information includes Understanding - Symptoms - And How to Prevent Disease Stroke. Disease Stroke - a condition that occurs when the blood flow to the brain stops. This makes the brain lose the supply of oxygen and nutrients that cause the death of cells in the brain. So that some parts of the body feel stiff and difficult to move. Stroke is a disease that attacks the nerves in the brain caused by rupture or blockage of blood vessels. Stroke is a medical emergency. Stroke sufferers can attack anyone, we can see if many stroke patients are still young. So that it does not guarantee a young age will not be stricken with a stroke. Therefore we must start a healthy life in order to avoid various diseases, one of which is a dangerous stroke. - Ischemic stroke, which is the most common. The cause of ischemic stroke is the presence of blood clots that clog arteries. - Hemorrhagic stroke, the cause of a hemorrhagic stroke is caused by a rupture of a blood vessel so that blood flows out. There is also the term mild stroke, when blood flow in the brain only pauses. Mild strokes like this can occur suddenly. You still need to be aware of minor strokes. Both the causes of mild strokes and serious strokes, all must remain vigilant. Mild stroke has a short duration of attack and in many cases, a mild stroke can recover in a few minutes. Usually the limbs cannot be moved for a few minutes or even days (weeks). But whatever it is will certainly interfere with our daily activities. 1. Sudden numbness or weakness of the face, arms or legs (especially on one side of the body) is the first symptom of a stroke. 2. Loss of sudden awareness, difficulty speaking or understanding speech is also a symptom of a stroke. 3. Sudden difficulties in walking, dizziness, loss of balance or coordination also need to be watched out for as a symptom of a stroke. 4. Sudden sudden headaches without known causes can also be symptoms of stroke. Remember, one keyword for the symptoms of this disease: initially symptoms ARRIVAL. If you find yourself or a family member complaining of these symptoms immediately, you should go to the hospital immediately because this disease is a medical emergency. Treatment for stroke must be given before it's too late. The initial thing that is usually done in the ER to initiate the treatment of stroke is to lay the patient down and flex the head (bend the neck forward) 30 degrees, then CT-Scan is the gold standard standard check to determine whether this is an ischemic stroke or hemorrhagic stroke, because the drug given for the treatment of different strokes this is not the same. The principle of treating ischemic stroke is to dissolve blood clots or while hemorrhagic strokes are to stop bleeding. Post-stroke rehabilitation that accompanies stroke treatment helps individuals overcome the defects that result from damage to this disease. Whereas TIA itself is an alarm against stroke so even though patients with TIA will recover as before in more than 24 hours, patients with TIA will still have to take blood thinning drugs obtained from doctors and maintain a lifestyle to avoid this disease. When a stroke strikes, the body will fall into the risk of death. Even if you survive, the patient will experience disability. Given the effects of disability and high mortality from this disease, you should avoid the risk factors. Check blood pressure regularly, always moving regularly like a road in the morning. One risk factor is high blood pressure. In addition, reduce greasy and fatty foods to reduce cholesterol. People who have had a heart attack are at greater risk of developing this disease, so, keep your heart healthy with adequate exercise. If you smoke, reduce it, even stop it as much as possible. Also avoid smokers because the smoke is very dangerous, especially for Stroke sufferers can cause heart disease. - Eating nutritious foods means lots of fruits, vegetables, and healthy grains, nuts, seeds, and peas. Be sure to eat little or no red or processed meat and limit cholesterol and saturated fat intake. Minimize salt intake to support healthy blood pressure. Keeping your body healthy is by exercising regularly, making sure the body is always moving and the brain is healthy. Sports such as cycling or running in the morning when oxygen is still clean from air pollution. Stroke Disease, Stroke Disease Information, Stroke Disease Article, Stroke Disease Information, Stroke Symptoms, Causes of Stroke Disease, Factors Causing Stroke Disease, Stroke Disease Impacts, Stroke Medication, Relief of Stroke Symptoms, Overcoming Stroke Symptoms, Stroke Disease Symptoms, Stroke Disease Management , Things to do with Stroke, What is Stroke, Definition of Stroke, Information on Understanding Stroke, Symptoms of Cause and How to Overcome Stroke, Stroke Detail Info, Tips to Relieve Stroke, Tips to Overcome Stroke Disease, Overview of Information About Stroke, recognize the causes and symptoms of Stroke, prevent Stroke by knowing the symptoms and causes.